Dingo Regular Chip Twists bring a twist of excitement to rawhide chews that dogs cannot resist. These treats are made with premium rawhide and real chicken that are twisted together to form a fun, new chew that goes beyond plain old rawhide chips. 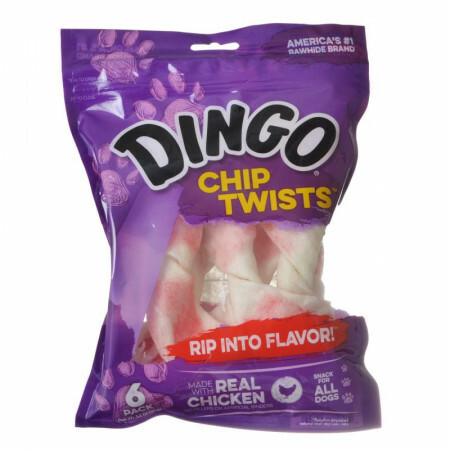 Chip Twist Treats can be given once every day for a full dose of fun and delicious Dingo flavor. Ingredients: Rawhide, Chicken, Water, Dextrose, Salt, Potassium Sorbate (Preservative), FD&C Red 40.